Juvenile delinquency, in all of its forms, usually doesn’t spell good news for anyone, anywhere, any time. Putting the obvious issues aside, delinquents in different countries act differently from each other, influenced by their cultures expectations and their specific reasons to rebel. So what about South Korean delinquents? I frequently hear of Japanese Yankees through so much Japanese media, but South Korean delinquency is new ground to me. The film Attack the Gas Station attempts to fill the gap in my knowledge regarding these delinquents. 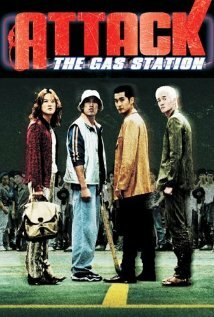 Attack the Gas Station originally premiered in South Korea in 1999, and later spawned a sequel film nearly ten years later. The film was directed by Sang-Jin Kim, whose other works include the animated adaptation of the Dante’s Inferno video game, Kick the Moon, and Ghost House. Additionally, the film was written by Jeong-Woo Park, who also wrote for the films Deranged, which had a U.S. release this past summer and Big Bang. Gas Station begins when a group of four delinquents, composed of philosophy-hating Paint, music-loving Rockstar, stick-carrying Mad Dog, and de-facto leader No-Mark, decide to stage a violent raid on an urban gas station one night out of sheer boredom, after having done so one month prior. After tearing the place apart and scaring the beans out of the employees, they threaten the station’s manager for money. However, when the delinquents realize the manager has stowed his money elsewhere, they proceed to take the station’s employees hostage in a separate room, and don the gas station’s uniforms to pass off as employees. When No-Mark manages to successfully scam an unassuming customer out of some money, the delinquents decide to play up their images of faux-employees to get more easy money. As the evening grows longer, chaos and violence begin to seethe forth as stranger events begin to conspire. A rival gang with connections to one of the station’s employees attempts to usurp the delinquents, only to get their asses fantastically kicked and thrown into the hostage room. Random late-night clients in need of gas find themselves locked into the trunks of cars instead. Oh, and some late night fast food delivery boys get pissed off because they hate late night fast food deliveries, especially when they have to deliver to a bunch of foul-mouthed felons. Between scenes of people getting beaten up with big sticks and an insufferable stuck up female hostage being forced into a strip-wordplay game, the back stories of the delinquents are slowly uncovered and expanded upon, from Paint’s wish to become an artist against his father’s wishes to No-Mark’s failed dream of playing baseball. Once the delinquents take over the gas station, you can bet it’s going to be along night. 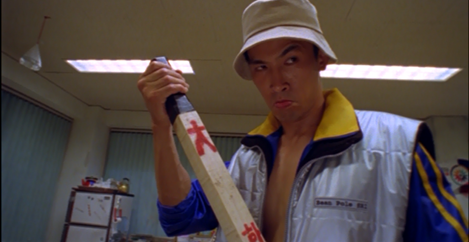 At first, Gas Station seems like a rather goofy, violent film, what with all the combating between main and minor characters alike, especially with the over-the-top antics and gang fighting that grows more and more ridiculous as the film progresses. But underneath all the bloody noses and thrown punches lies a surprising amount of characterization in respect to the delinquents. At a first glance one might just lump them all together as being a bunch of hard-headed hooligans without anything resembling remorse for others, but in all actuality, this ends up not being the case. The eccentricities of the delinquents help define their differences at first, whether they be Rockstar’s apparent need for constant music or No-Mark’s insistence on the hostages sitting themselves in uncomfortable positions. However, their back stories in all their gloomy glory, add an extra layer of refreshing description to their characters that could have easily been skipped over. Likewise, even the minor characters are given their own characterization, such as the timid station employee sticking up for himself and dealing with a former bully-turned gang member. These details help keep the cast interesting and engaging, rather than just dull faces hiding under all the action. Attack the Gas Station tosses up a few servings of social commentary, though they aren’t exactly obvious at first. Case in point, the scene in which Paint sees a framed picture of inspirational words hanging in an indoor office and violently smashes it up was meant to reflect how the internal conditions of South Korea at the time affected its youths. These subtle scenes might not really come off as anything significant to the main story, but they do depict how the effects of a country’s state can up affecting its people. The addition of social commentary gives Gas Station a means of subtly standing out, rather than just being a big ball of people punching each other. Pros: Good amount of distinct characterization, for both the leads and some minor characters. The social commentary helps keep the story interesting without shoving it down viewer’s throats. Despite all of the violence and fighting, it still manages to be very funny and balances its humor with increasingly over-the-top action. Cons: The social commentary aspect is strictly secondary and easy to not notice. The movie’s pacing drags at some points, which makes some of the action feel tedious. Attack the Gas Station has a licensed U.S. release by Media Blasters, as a part of their “Tokyo Shock” label. Gas Station is definitely a fun ride, but still manages to whisper a message about society amidst the angry screaming of people fighting. If you ever want a not-painfully brainless action/comedy film with fist-fights, fun characters, and general chaos, Gas Station is worth a look. ‹ Megazone 23 Special – Part 3: It’s A Thing……..About Robots?